An age-old question for birders traveling to far off locations is "Should I bring my scope and tripod, and how do I pack them?" With today’s restrictions on luggage size and weight and the extra cost of carry-on bags, the gear we use at home may not be the best choice for travelling. The Gitzo Safari Traveler tripod solves the problem of tripod size and weight. The Safari Traveler is a carbon fiber tripod that weighs only 4.2 pounds including the head and folds down to 20.9 inches. With dimensions like these, Safari Traveler tripods will easily fit any suitcase, duffle, or backpack. 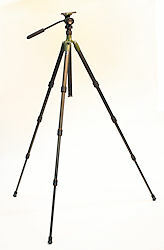 Despite its small folded size, the Safari Traveler is a full-size tripod. Its maximum height is 64.6 inches with the center column fully extended, and 51 inches with the column retracted. Gitzo combines full size with compact folding dimensions by using a 4-section leg design. Despite its low mass, the Safari Traveler tripod provides excellent stability for heavy spotting scopes or video cameras. The leg design incorporates multiple layers of interwoven carbon fibers for maximum vibration dampening and rigidity. Additionally, the design of the center joint (where the leg hinges attach and the center column passes through) and the "neck" (the tube through which the center column slides) both contribute to greater overall stability. The hinges are precision manufactured to have virtually no side-to-side play. The neck is, so far as we know, unique to the Safari Traveler tripods. This tube is about three inches long where the corresponding section of other tripods is not usually much longer than an inch. Thus, the neck more effectively restricts sideways play when extending the center column. It also is easier to operate since this longer tube enforces better alignment of the column, making it easier to adjust. Lastly, most center joints feature a set-screw to adjust tension on the center column, but the presence of this screw as part of the center joint actually contributes a bit of instability. The Safari Traveler employs a twist collar lock (similar to the leg locks) at the top of neck portion, which is inherently much more stable than a set-screw. The Safari Traveler achieves its most compact folded conformation by first extending the center column to its full height, and then collapsing the leg sections with the twist collars. The final step is to use the spring-loaded sliding leg angle locks located just above the hinge on each leg. Opening these slider locks allows you to fold the leg completely up until it is next to the extended center column. As noted above, the carbon fiber legs feature a 4-section design. This is inherently a trade-off: more sections provide more compactness but at the cost of slower deployment… usually. As a rule, we prefer lever-locks on tripod legs to twist collars, which are usually slower. But that was before we saw the twist collars on the Gitzo tripod. These collars deploy with less of a twist required, as though the mechanism had a steeper pitch inside - what you notice is that you don't have to twist as much to lock or unlock these. The second point is that when the legs are fully collapsed, by correctly placing your hand, all three locks can be undone with just one twist, which makes this quite quick indeed. The feet on the Safari Traveler legs are rubber and are sort of rounded and pointed at the same time, a nice bit of design. Like many tripods, the Gitzo Traveler has a hook mounted on the bottom of the center column from which to suspend stabilizing weights. The difference with this one is that it is squared in shape and spring loaded so that, when no weight is on it, it retracts neatly until it's flush with the base of the center column. This means it won't catch on anything inadvertently. Another birder-friendly addition to the Safari Traveler is the inclusion of the Gitzo GH2720 head. This head incorporates both the pan and tilt controls in a single knob . Not only does this one control efficiently combine both functions, but it features a lovely intermediate tension level whereby both controls can be freely manipulated, but without being so loose that the optic swings or falls inadvertently. This is really well designed! The head accommodates quick release plates compatible with Manfrotto 501 series heads. The head comes standard with a Manfrotto 501PL plate and can also accept the 501PLONG plate (see "Digiscoping" below). The bracket for the quick release plate is short (about 1-inch long) but precisely manufactured so that the plate slides easily along its track. The head features a two-part safety catch, with a tension adjusting screw on one side and a spring-loaded release button on the opposite side. Both controls are positioned so that they don't interfere with the handle in any position. The Safari Traveler, due to its inherent stability and advanced head design, makes an excellent platform for digiscoping. By easily accommodating the extra-long 501PLONG quick release plate, the Gitzo Traveler offers the option of precise counter-balancing of the heavier digiscoping rigs with a DSLR camera, or the more lightweight rigs with a point-and-shoot digital camera. However, if you wish to use the Safari Traveler for general photography, we recommend purchase of an alternate head as the GH2720 head can only be used in a landscape orientation.